The final studio in which Delacroix worked is also, spatially, the last in a series of seclusions. It’s a wonderful large square, lit by immense skylights, and surrounded by gardens that Delacroix filled with a profusion of flowers, their colors of his own careful choosing. The studio building is behind, and separate from, the apartment in which Delacroix lived. This apartment is itself on a private courtyard holding quiet entrances for a few buildings. The courtyard is off a small quiet square, really a slight geometric expansion of a narrow street, the Rue Furstenberg, an untrafficked byway not far from the great church of St. Germain des Pres. The studio was recommended to Delacroix by the restorer and color merchant Etienne Haro, who knew that the artist, unwell in his later years, needed to be within walking distance of St.-Sulpice, where he had undertaken a last sequence of great murals. A study in hot and cold, Delacroix as a personality and an artist was in continual motion between shade and gleam. He was revered for his color sense, both daring and precise, and the palettes now on display at the Musée Delacroix make his color sense dramatically visible. was said to have been given by Delacroix to Henri Fatin-Latour, a great admirer of Delacroix. Fatin-Latour, angered by the lack of official commemoration of the master’s death, painted an Hommage à Delacroix. 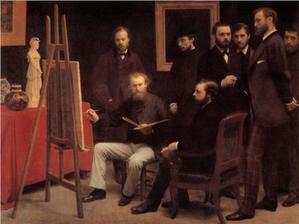 The palette that may have belonged to both Delacroix and Fatin-Latour was eventually donated to the Musée Delacroix by the granddaughter of Léon Riesener, and the Riesener family, through its friendship with the Morisot sisters, provided another, personal, conduit by which the palette of Delacroix was transmitted to the Impressionists. This summer, the Musée Delacroix has an exhibition of works that show the influence of Shakespeare on Delacroix. Like Berlioz, Delacroix was greatly moved by the force of drama in the works of Shakespeare and there are wonderful etchings of instants of great intensity from Hamlet (Hamlet on the terrace approached by his father’s ghost, the moment before the stabbing of Polonius, the moment “up, sword” of deciding not to kill Claudius at prayer). 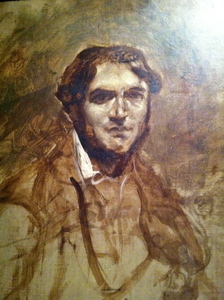 There is also an oil sketch of Léon Riesener, a cousin and confidante of the painter, himself a painter, and a legatee of Delacroix’s. This portrait shows a broad and sympathetic face, tones all of brown and white. 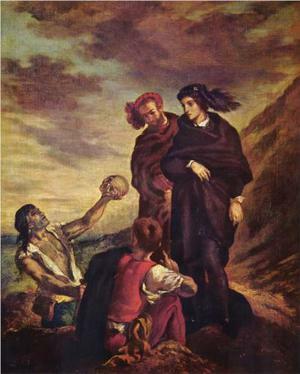 In the background and upside down are discernible sketches for another picture, Hamlet and Horatio in the cemetery with the skull of Yorick. 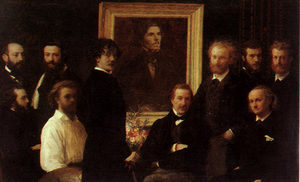 Bequeathal, and legacy were vexed issues for Delacroix, who, says Baudelaire, was increasingly preoccupied with which of his contributions would endure. Walter Benjamin notes the aptness of Léon Daudet’s phrase for Baudelaire. Daudet writes that Baudelaire had a “trap-door disposition, which is also that of Prince Hamlet.”4 I take this to mean a theatrical, or a magician’s, feeling for circumstances and their manipulation. Appearances and disappearances, sudden dispersals, going within to get out. There seems to be something of Delacroix in the phrase, too. I see two ways out of this series of reflections: one is to try to see further inside the man, the other to try to see further into the legacy of his works. These efforts do not amount to the same thing, but perhaps could be displayed immediately next to each other. Walter Benjamin, whose interest in Delacroix grew in part from Benjamin’s profound relationship to the works of Baudelaire, notes that Delacroix was interested in photography, and that his paintings “escape the competition with photography, not only because of the impact of their colors, but also (in those days there was no instant photography) because of the stormy agitation of their subject matter. And so a benevolent interest in photography was possible for him.”6 The ever more profound and fragmentary sense of color, and the idea of creating motion through the juxtaposition of contrasting colors, these went on being a significant part of how painting responded to photography through the rest of the 19th century. 1 Baudelaire, Critque d’art, “Eugene Delacroix, son oeuvre et sa vie,” p421, translations mine. 3 from Ernest Seillière, Baudelaire, (Paris, 1931) cited in Walter Benjamin, The Arcades Project, edited Tiedemann, translated Eiland and McLaughlin, (Cambridge, 1999) p277. 4 Daudet, Les Pélerins d’Emmaus, Paris, 1928, p101, cited in Benjamin, Arcades Project, p265. 6 Benjamin, Arcades Project, p678. 7 Baudelaire, Critique d’art, p418, p406. The Impressionists were my first painters, as I think they were many peoples'. They required no explanation. I liked them. I came early to painting and at twelve was fervently memorizing schools, dates, palettes, styles, as other children at that age remember scores, teams, clothes, lyrics. The works of each painter moved in my mind like small rushing galaxies; at museums, I knew a Degas or a Monet across a room. As one grows older one comes to like bitter tastes. The first sweet passions of youth, even if still felt now and again in private, seem soft, insufficient, a little embarrassing. 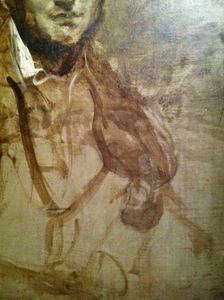 Coffee, Beckmann – one turns to darker matters. The Impressionists don’t seem troubled enough; theirs are styles without irony. One of the difficulties of seeing the Impressionists again is to learn to see the difficulties. The paintings – reproduced in cheap metal frames in every dorm room and dentist's office – can seem as if they're not really paintings, not really individual canvases labored over by individual artists, at all. Even the story of them, the way the artists were shunned by the Academy and were hungry and obscure and worked in a manner at the time genuinely radical and offensive, all seems shaded over with a sort of happy satisfaction. When I try to say what this happy satisfaction is, the one that these paintings can seem to exude, I find myself thinking that it is vaguely akin to the feeling of shopping. Shopping – in the sense of ordinary middle class people wandering about in a maze of acquirable but not strictly necessary commodities – came to have certain peculiar characteristics in the 19th century in Paris as the Impressionists were growing up and beginning to paint. Goupil, of whom it is immediately noticed if he has put out a new painting, opened the first retail house for the sale of paintings in 1829. The Impressionists were among the first French children to see paintings in shops. A fragment of an Etruscan fresco displayed in a Paris art shop window looks very different than a painting painted after the 1830s does in the same window, and part of the reason for this is deep in the consciousness of the painter, who knows his work is going to be seen this way, and who, as a result, gets unavoidably entangled in questions of style. Here is what Larousse’s image of the scrutinizing flâneurs suggests to me about an emerging idea of style. Examination, at a distance, of wares behind glass, of the style of shops, and the examination, at a distance, of bodies enveloped in clothes, of the wares walking about, recognizable by their style, a style that is an intricate combination of the style of the designer / manufacturer and the style of the wearer. Little thin layers of the exterior and the interior, wares of shops to be displayed inside homes and outside bodies; the painter of costumed bodies in decorated interiors reproducing these wares as further wares. It was a troubling feature of the Metropolitan Museum's recent "Impressionism, Fashion, and Modernity," exhibition that it was harder than usual to tell the difference between the exhibition itself and the gift shop set up at the end. In the exhibition halls, mannequins in glass cases modeling clothes similar to those in the paintings had the effect of making the paintings seem like fashion plates for a magazine. Although this was possibly a productive confusion, it made me unhappy. I came away with an incipient thought that the Impressionists' use of paint texture becomes a means of distinguishing the paintings at a great distance. A painting, like a dress along a boulevard, now had to be recognizable from afar – commerce adjudicated in the space of the 19th century city with its fashionable women and magazines of fashion. In a way this might be considered a further step related to that of the late medieval Italian painters who began to paint on portable canvases and to sign their pictures. The authenticity and saleability of the object, both at once, are established by the signature and, in the later case, by the signature style. Part of what now makes us, or me anyway, suspicious of the Impressionists is how saleable they are. The ever higher prices the original works command seems but the top of a pyramid of sales: you can buy reproductions of Monets in good oil paint for many hundreds of dollars, in museum gift shops you can buy silk scarves made in Italy with patterns of Monet’s water lilies on them, online you can order for your baby a onesie made of camouflage fabric printed with a Monet. All this apparel, for the exterior of the body and the interior of the home seems to make the Impressionists blameworthy. As if their facility with style and shopping diminishes their work. But perhaps this is a way of deflecting my own attention from the much more disturbing problem that museums have to a great degree set themselves up as large department stores, in which one acquires “looks” and purchases suitable accoutrements and mementos at the end of the visit. A Beckmann seems to scorn my commercial desire, have I been mistaken in worrying that the Impressionists comply with it?